So, since our last post we have kayaked through a minefield of thunderstorms, been robbed, crossed 'Shark Alley', battled through a number of reefs and found out that George achieved his Grade 2 ballet (!) when he was seven years old. After making it just north of Mayaguez we were warmly welcomed in by Carlos. His Blue Whale Apartments ended up being our home for the next four nights as we rested our bodies before the ominous Mona Passage. We've touched on people's amazing generosity in the past and Carlos was no different. After settling us in he made sure we had a fantastic breakfast the next day, kindly drove us into Mayaguez to process through customs and gave us a wonderful tour of his great town Anasco and the surf village of Rincon! Carlos; One of life's good guys. We were able to make sure the boat was as prepared as possible for the countless terrible tales of the Mona passage we had read about and had a very early night. Unfortunately, the weather was not looking good. We woke up at midnight fully prepared to get going but after a quick weather check it was apparent we were going nowhere. Gusting winds of 17/18 knots against the current would have caused extremely difficult swells. On top of that, fighting the unpredictable current and potentially battling into the wind made the decision to stay a no brainier. We delayed to the next day and without hesitation Carlos jumped to our rescue. Offering another night and support if we needed to go anywhere, the supermarket, pharmacy or just to get out the house. After a day of frustrated waiting and killing time we were ready and set to go again. Midnight. We woke again and had our final weather check. No good, the weather had closed in again and the same conditions were present. We just couldn't risk it and on reflection we definitely made the right decision. With the prospect of another days delay looming we made contact with Carlos again. Again he jumped to our rescue. Sensing our frustrated mood he decided to take us in the morning with his wife to get a brilliant breakfast. After that we headed to the farmers market in Rincon and were treated to some great local foods and gifts. Their hospitality was just incredible. We were dropped back home and eagerly checked the most recent weather updates. At last. It looked like we had a weather window to set off at midnight. Carlos treated us to a brilliant final dinner and we were tucked up in bed to get our 4 hours sleep in. It's fair to say the nerves were building but they were overrun by itchy feet and the excitement to get moving again. At midnight, after just 3 1/2 hrs sleep we were up and ready to go. Almost everything had been prepared the night before so we just had to pack the last few things into the bags, carry them and the kayak onto the beach (the boat is too heavy to lift when loaded), pack it and leave. This we did. Unfortunately, though, we soon found out that some other people had taken concern over how heavy our kayak was and had thoughtfully relieved us of some of the weight... unfortunately, they included some of our most crucial kit. - Our emergency grab bag with flares and spare radio. Clearly the last item was the high value and most important loss for us and left us with a difficult decision as to whether to embark on the passage or not. We decided to go. We still had a VHF radio we could keep turned off to maintain battery, strobes to use to identify our location and a good weather window to complete the crossing. After our two day delay we were in no mood to be set back again. Now, what does "scattered thunderstorms" (NoAA Marine Forecast) mean to you? Well as you may have gathered from previous posts we are becoming more and more knowledgeable and accustomed to thunder and lightening and our experiences took another leap when we found out exactly what "scattered thunderstorms" are. They essentially turn the passage into a huge minefield. The mines are visible - as massive black clouds over towers of slashing rain that now and again light up as lightening strikes threateningly around them - and the mines are also moving... much faster than we can... but their direction is very hard to determine when it is dark. After our disappointment first thing in the morning and a couple of hours of feeling sorry for ourselves during which we actually made pretty good progress we were starting to feel a little better. Then the lightening flared up. The next thing we knew we were sat in the middle of the minefield with thunderstorms to our left, thunderstorms to our right and and a thunderstorm to our front. We waited for a nerve-wracking half an hour before we were confident enough that we were not going to kayak into the path of any of them and then continued on. But progress was much slower than before. It got light a hour later and the wind started to pick up, not coming from the East as forecast, but from the South i.e. against us. 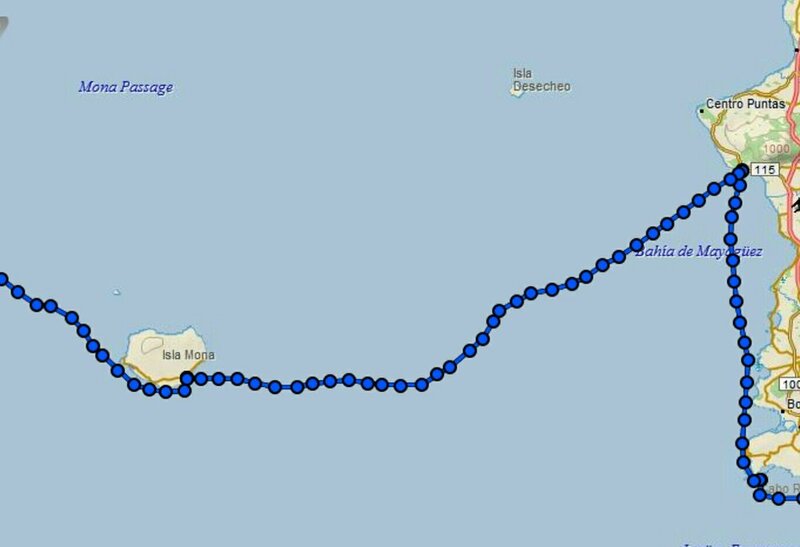 We also had a bit of a tango with the currents but overall managed to keep a steady, albeit slow, course towards Isla Mona. You can see we were heading south west until we were in line with Isla Mona and then turned Westward in order to avoid the crazy northerly currents on the East coast of the island. The crossing was long and hard. There's not much more to it... it was a slog... and for a long time in the middle there was no land in sight. At long last Mona island changed from being a dot that never grew bigger to the beach we planned to land on. We paddled closer and saw a reef that stretched down the whole beach. With no clear entry to land and only an hour of daylight left we weren't overly pleased by the situation that faced us. Before deciding to paddle onwards Will luckily spotted two signs to guide us through a narrow channel into shore. We squeezed through the channel with breaking waves either side of us and finally made land. 16 hours in the boat and we were more than ready to stretch our legs. We jumped out and began unloading. Mona being an uninhabited island we expect nothing but a small hut was visible in the distance and we decided to check it out. After unloading the boat the quiet hum of an engine approaching caught our attention. The one ranger on the island appeared in his buggy with the one police sergeant. They began to interrogate us in Spanish, looking both confused by the fact we were saying we had crossed half the Mona passage and excited by our arrival. After verifying our documents they chopped us some coconuts, said we were more than welcome to sleep in the hut, wished us luck for the next day, took some pictures with us and disappeared into the distance. With darkness now just minutes away we quickly cooked some dinner and climbed into our hammocks. 3 hours later and alarms were ringing and we were up and ready to go again. No photos of any of this.. we were too tired. We loaded up the boat, found the glow sticks we had placed on the signs guiding us through the reef and took a deep breath. Too far right or too far left and we would end up on the reef, jagged rocks and huge breaking waves. In total darkness we had to trust the glow sticks we had positioned on the beach. 10 minutes later and we had made it through the reef. Such a overwhelming feeling of relief was quickly replaced by three looming thunderstorms. After 30 minutes we decided they were far enough away and paddled on. Just 5 minutes later and our next problem arrived. We spotted some breaking waves, just a couple of metres from where we were. We pointed our powerful dive torch into the darkness and barely a metre from us was a lump of rock lurking just beneath the surface. We sharply turned the boat and headed far out from Mona Island. An island that looks like paradise, but one that is riddled with hidden dangers. Continuing until sunlight was uneventful. Our bodies ached badly after the hard paddle the day before and the prospect of another 17 hours in the boat was not doing much for our moods. The day passed slowly and uneventfully apart from a few oil tankers in different directions. The Mona Passage, also known as shark alley, was fortunately not living up to its reputation. 16 hours later and we were nearing the Dominican Republic. We had fortunately been offered accommodation at the last minute and were pleased to have a place to stay. Unfortunately we hadn't marked it properly on the map, after heading to the Cap Cana marina we received a message on the satellite phone from HQ letting us know we were heading in the wrong direction. Under the assumption we were just a mile from shore it did not come as happy news that we were in fact 4 miles east of where we needed to be. We changed bearing and started heading west along the coast. More reefs and rapidly fading light created a stressful situation. We continued along the shore, stopping frequently to ask for directions. No one really knew which direction to point us. Continuing down the coast the hospitable beaches were turning to rocky shores, huge dark clouds appeared and the sun was preparing to set. The wind suddenly rapidly picked up from the storm approaching and we had nowhere to land. We rounded a headland with fingers and toes crossed that there might be a beach. We were in luck, a tiny beach appeared in front of us and we sighed with relief. We were, however, naive to think the day was done. The wind had kicked up some aggressive breaking waves crashing into the beach that made the landing a serious concern. With no other option we counted the sets of waves and went for it. Spray decks up and ready to jump out the boat and drag it up the beach when we landed we managed to just escape being rolled by the wave that took us to shore. Desperation struck when this was clearly not where we were meant to be. The beach was over grown by jungle and it was now dark. Spotting a small hut in the jungle we went to speak with a couple of the locals. They told us we need to be another couple of miles down the shore for our accommodation. Quickly surveying the state of the sea and darkness we decided we weren't going anywhere. It was now time to put all our faith in the local Dominicans. Trust them or not we didn't have much of a choice. They kindly said we could leave the kayak outside their hut and pointed us up a dirt track to where the road was located. Unloading all valuables they escorted us with machetes and torches up the dirt track to the main road. They halted a passing car which took us 10 minutes down the road to our accommodation. Such relief after an incredibly long and eventful few days!